One of the most costly expenses when you vacation is food. It’s also one of the more difficult purchases for which to budget, even though many restaurant menus are now online to help you pre-plan what you will spend. What tends to happen is we end up becoming more picky about where we eat on the road because we want it to satisfy our hunger both for food and for experience. Will the food be worth it? is a question that takes on greater importance when you only have a few days in a place. How do I stretch my budget and experience the best of local culture? is another question many travellers ask. Here are tips on how to save on your food budget when you travel, while maintaining your desire for an enjoyable visit. 1. Know your hotel choice. Book a hotel that includes breakfast and pre-pay for the stay, which will reduce your accommodations cost by at least 5 per cent at most lodgings. Hotel breakfasts can often be overpriced but a cost reduction through pre-payment is beneficial for more than just your pocketbook. It saves you time — eliminating a decision on where to eat in the morning — and gives you some peace of mind because you will have paid for this cost before you arrive. 2. Sleep with a kitchen. Better than paying for breakfast (or lunch or dinner) is having the ability to cook it yourself. 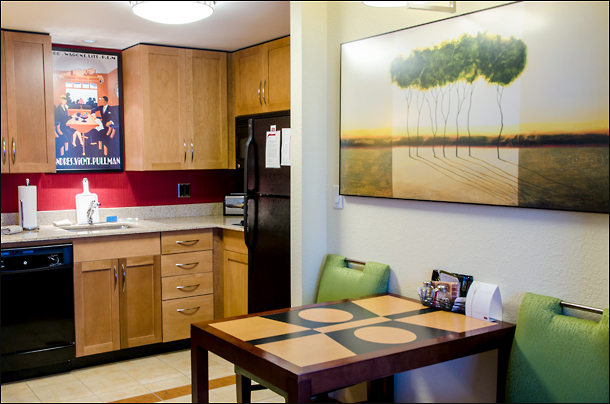 More and more hotels are providing their own kitchens, a feature that many timeshare owners have long enjoyed. The benefit of having a kitchen — or at least a microwave and fridge — is it gives you the option to further control your food costs. A trip to the grocery store soon after check-in will give you a stockpile of choices for late-night snacks or an all-out gourmet feast if you choose. EXTRA TIP: Pack a few teaspoons of your favourite spices in spice containers made specifically for travelling. You’ll find them in the kitchenware department of many retail stores. It’ll save you from buying full containers of spices once you arrive at your destination. 3. Eat meals prepared at grocery stores. Even if you don’t have a kitchen in your room, you should still go to the grocery store. Some of the best cheap meals you’ll find in any North American city are in the prepared food areas of supermarkets. Whether it’s Whole Foods in New York, Rouses or Langenstein’s in New Orleans, or even Longo’s in Toronto (where a gourmet 10-inch pizza can be had for less than $7), you can find outstanding, freshly prepared food that won’t break your budget. You also won’t need to tip or wait for a table. Although some health experts will tell you that grocery stores tend to cook their prepared meals with meat and fish products that aren’t the freshest in stock, you’re still more likely to get a healthier meal from a grocer than from a fast-food restaurant. 4. Visit the local farmers’ market. Farmers’ markets are booming across North America thanks to the locavore movement and the desire for environmentally friendly community building. The markets offer both a travel experience — because you will find out a lot about a city’s culture through the people who cultivate and consume its local produce — and a fun dining experience as you sample bits and bites from different vendors, many of whom offer samples. Canada is extremely lucky to have thriving farmers’ markets across the country, particularly in Ontario. 5. Adjust your Groupon deals account. Those online coupon companies that just about all of us take advantage of when we’re at home can come in handy on the road too. Adjust your Groupon or Living Social account to show deals in the destination you’re visiting and you’ll find discounts on restaurants, as well as some attractions.